If there was any one man who articulated the anger, the struggle, and the beliefs of African Americans in the 1960s, that man was Malxolm X. His AUTOBIOGRAPHY is now an established classic of modern America, a book that expresses like none other the crucial truth about our times. "Extraordinary. A brilliant, painful, important book." 4.0 out of 5 starsvery nice! 1.0 out of 5 starsTHE EPILOGUE HAS BEEN OMITTED!!!! Let me be crystal clear and extremely frank in this review. 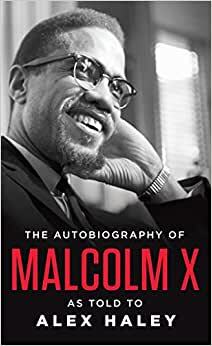 The Autobiography of Malcolm X is my FAVORITE book and, I believe, one of the most important books written in the 20th Century. There have been many printings of this book and they have had slight alterations throughout their publishing. The original 1965 edition came with photos. There have always been three missing chapters that are still held by a private owner. However, Penguin Modern Classics has reprinted this essential piece of literature anew-WITHOUT THE ORIGINAL EPILOGUE or Ossie Davis' contributions to the work. This means, essentially, THAT THE ASSASSINATION HAS BEEN REMOVED FROM THE BOOK! Reading this version of the book will leave the reader wondering how Malcolm was assassinated, who was responsible and so forth. In addition, the first page of the book is a generalizing synopsis that has the audacity to claim that Malcolm advocated change through the vehicle of violence. Anyone who has read the complete Malcolm X Autobiography in depth knows fully well that this is untrue, an absolute falsity and misrepresentation that can lead to dangerous miscalculations. Omitting the Epilogue, for a topic this serious, is not only censorship, but one must conclude that it was done intentionally. If it was done intentionally, the only real motive could be to mislead a new generation of people trying to learn THE TRUTH about Malcolm. It's a shame that they won't be able to find all of it in his own book! 1,374 people found this helpful. 5.0 out of 5 starsSouthern white boy's seal of approval! Again. Great story, great storyteller! My first reading was back when I was a kid in rural 1968 Georgia. I had heard all about the man from the evening news, other kids parents through their biased know it all young'ens, and of course some of my own opinionated older family members. Why was everybody so worked up about this guy still, three years after his death? So I took it upon myself to read his story for myself. His story stuck with me through the years, always one of my favorite reads. I could never convince others to try it, it was then and still is that controversial. Fifty years later...I bought a copy to re-read his story ( with hindsight as judge). I still feel glad that I chose to read this then and again now. This story is still relevent today. I highly recommend that everyone should read this book, at any age! After watching the Spike Lee film this book has long been on my reading list. I was a little hesitant because I might be so outside of the experiences of Malcolm X that I might feel disconnected and alienated that it would be a tough read but I couldn't have been more wrong. I was totally absorbed in this story. The writing makes everything come alive as we share this emotional and spiritual journey. I devoured it in a week's time. It becomes compulsive after a while. I was mesmerized by the evolution of this man. He was flawed as he himself would remark and still growing. Yet another life silenced by violence. What would he might have continued to do had he lived and joined forces with other black leaders whom he previously had contempt for. We will never know. The story is inspiring and a cold reminder that so little has changed since then. I cannot recommend this book highly enough. My own favourite section is when he is in prison and discovers a passion for books and knowledge. As a lifelong reader the idea of this discovery eternally kindles my own passions. It is a remarkable book. I would easily place it on my list of all-time favourite books. It's a reason that Malcolm X (El-Hajj Malik El-Shabazz) survived his violent past and completely turned his life around. Since his early life, he was able to analyze situations well and influence people before he was even a public speaker. Malcolm X and his involvement with the Nation of Islam was just a step in his life. He realized the need for a non-religious organization for black people to transcend their current conditions. As for Islam, Malcolm X's pilgrimage to Mecca and his account has developed, for me, personal interest in the religion of Islam. It's unfortunate that Malcolm's life was taken by ignorance. He was wise and not afraid to admit his faults. He was for the truth no matter what. El-Hajj Malik El-Shabazz is currently the only renown person I wish I could accompany. 5.0 out of 5 starsAmazing to say the least. About 20 years ago I watched the movie with Denzel Washington about the life of Malcolm X. At the time I had no idea who he was at all. Now after all these years, I came across this book and knew that I had to get it. I've always been a huge fan of biographies and this definitely didn't disappoint!! Without giving anything away, I will just say this... The writing is absolutely fantastic and holds nothing back when it comes to his past and the details of such. It was extremely informative and interesting to read. Anyone who is a history lover, a biography lover or was like me and just wanted to know more about Malcolm X will thoroughly enjoy this. Personally, I think everyone should read this so that they can understand better the man, his views and opinions, the environment at the time and how he came to his opinions and views. It was very easy to read and at times I found it hard to put down!! I highly recommend this book and after the countless biographies I've read, I definitely put this on the top as most important to read.